John Graves (1795-1877) came to Livingston County in 1837 and established his tavern/hotel about a year later. It was located on the southwest corner of Washington and Jackson Streets, the future site of the Chillicothe State Bank. On one occasion a guest at his hotel found fault with the bill of fare because it was composed of fat bacon swimming in its own grease, corn-pone bread, potatoes in their jackets and black coffee. Mr. Graves caught the fault-finder by the collar, lifted him out of his seat, led him to the door and kicked him off the porch, explaining his conduct to the bystanders as follows: "The damned skunk insulted my boarders and I won't stand it. My boarders eat my fare and like it, and when a man makes fun of my grub it's the same as saying they haven't sense enough to know good grub from bad. I am bound to protect my boarders!" "The undersigned, wishing to turn his attention exclusively to farming, offers for sale his tavern house in Chillicothe. The building is a substantial two-story frame, having three rooms on the first floor and four on the second. The dining room, on the first floor, extends the whole length of the building. Attached to the main building is a family room, and two comfortable kitchens, with a fireplace in each; also, two good wells in the yard, smokehouse and dairy. It is situated on the southwest corner, opposite the public square, and the ground attached embraces five lots, all of which is admirably situated for out-buildings and cultivation. Terms, one-third cash; balance in one, two and three years, and immediate possession given. -- John Graves"
He still owned the hotel in 1856 but disposed of it after 18 years in the business. He moved to a two-story brick residence on Graves Street, on or near State Highways 3 and 8. 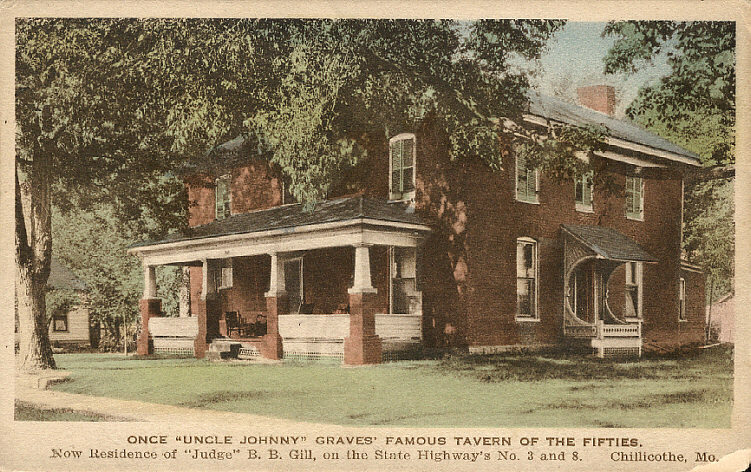 The nearness of this home to the main road caused it to become a tavern too, for it was said that Graves could never say "no" to a traveler who wanted a bed and breakfast. Consequently, later generations often confused the original tavern with Graves' retirement home. The photo above, taken in the early 1920s, is of the Graves residence. History of Caldwell and Livingston Counties, Missouri, 1886. Chillicothe Constitution-Tribune, Sept. 20, 1924.